2016 Winning Entry from Miles Yun. The Endangered Species Coalition (ESC) is pleased to announce our 2017 Saving Endangered Species Youth Art Contest, which is open to K-12 grade students, including those who are homeschooled or belong to a youth/art program. The contest is an integral part of the 12th annual Endangered Species Day on May 19, 2017. 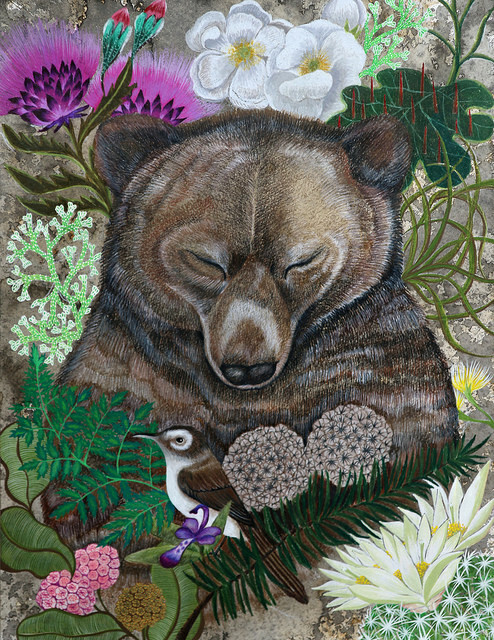 For more background on the contest, including an art lesson plan for teachers and other resources, please visit www.endangeredspeciesday.org. All artwork must depict species chosen from one of two lists as noted in “Subject Matter” (below). We will make no exceptions to this rule. Entries must be received by March 1, 2017. Late entries will not be judged. All entries become the property of the Endangered Species Coalition. Alternatively, students may depict a species that was previously on the endangered species list but is now considered recovered. You can choose a species from this list. We strongly encourage participants to have their pieces tell a story of hope. An example of this could be a painting of an endangered marine species with people in the background cleaning up a beach. Judges particularly appreciate artwork showing species in their habitats. Don’t forget about the plants that support all life! Media: We can accept artwork done in crayon, ink, acrylics, oil paint, pastels, water color, colored pencils, scratchboard, color marker, chalk, pastels, charcoal, or paper collage. We cannot accept artwork done using plain black pencil or weak colored pencil. No lettering, words, signatures or any other markings may appear on the front of the artwork. This includes labeling the depicted species, writing one’s name, or a signature. Lettering that is creatively incorporated into the art (such as a posted sign) is allowed. Submissions that include prohibited writing will not be judged. Artwork should be submitted electronically at endangered.org/submit-your-art. It must be 3300×2550 pixels at 300 dpi resolution. Follow directions carefully and provide all information requested on the submission form. You must submit your artwork by March 1, 2017. Late entries will not be judged. A prestigious panel of judges will select winners in four categories: Grades K-2, Grades 3-5, Grades 6-8, and Grades 9-12. The grand prize winner will be selected from the four grade-level winners. In choosing the grand prize winner, judges pay particular attention to the concept or story that the artwork tells. We encourage artists to pay attention to the theme, saving species. Grand Prize: The grand prize-winner will receive a round-trip flight arranged by the Endangered Species Coalition to Washington, D.C. and accommodations chosen by the Endangered Species Coalition for himself/herself and one guardian to attend a rewards ceremony in May, 2016. All other expenses related to the trip are the responsibility of the winner’s guardian. The grand prize is not redeemable for cash. The grand prize-winner will also receive an art lesson from a professional wildlife artist (in person or via Skype) and $50 worth of art supplies. In order to provide a competitive opportunity for as many youths as possible, the grand prize winner is not eligible to win again for three years. Grade Category Winners: Each of the grade-level winners will receive a plaque and $25 worth of art supplies. ESC will award certificates to second- and third-place finishers and contest semi-finalists (usually the top ten in each grade category). In addition, teachers, parents, and youth leaders can download and print a Certificate of Participation for all contest participants here. The Endangered Species Coalition will seek opportunities to exhibit the artwork of the contest semifinalists.